The Japanese Names of Medical Herbs (本草和名 Honzō Wamyō, honzoo wamyoo). Water quality is vital for mizu wasabi (water horseradish), which grows in running water. The three necessary conditions require the water to be so clean that iwana (char) and yamame (landlocked salmon) can live in it, to be plentiful, and to have a temperature from 8 to 18 centigrade all year round. 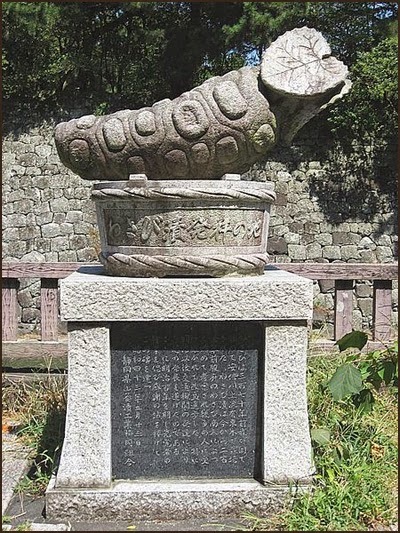 In Kansai, wasabi is cultivated in Kakumagi, Wakayama Prefecture, where wasabi is presumed to have originated, and in Azai Town in Shiga Prefecture's Kohoku area around the northern part of Lake Biwa, both noted for their water. 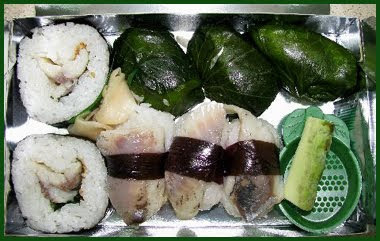 Wasabi sushi, in which rice and salted mackerel are rolled in a wasabi leaf, is a famous product of Shimizu Town in Wakayama. The Daioo Wasabi Farm lies in the peaceful outskirts of Hotaka town and is recognised as the largest such farm in Japan. Founded in 1915, the farm has enjoyed a long history throughout the years that has even seen it featured in the 1990 film Dreams, directed by the internationally acclaimed director Akira Kurosawa. The quaint watermills that were especially constructed for the film remain in the farm today, and can be best viewed by taking one the special raft-tours that are available throughout the spring and summer months. While the Daio Wasabi Farm has long been a favourite of Japanese tourists for its picturesque beauty, the farm is also notable for the wide-array of culinary delights offered by its restaurants and shops. Visitors can try traditional staples such as wasabi soba (buckwheat noodles, a local speciality) and wasabi tempura (deep-fried prawns and vegetables), to the slightly less conventional likes of wasabi ice-cream and wasabi wine - surprisingly delicious, despite their rather strange sounding taste! for examle in 安曇野 Azumino, Nagano pref. wasabi and Joruri puppet theater recitation are praized with your tears. Good wasabi is so hot you start to cry. Good bunraku theater performance is so sad that you cry. Wasabi und den Begleitgesang beim Puppentheater lobt man durch Tränen. Wasabi muss man mit einem ernsten Gesicht reiben. you should do it strongly and seriously to get the pungent ingredient アリルインチオシアネートout of the root. So you have to keep grinding more and more in a good circle to prepare a good wasabi. wasabi is called namida なみだ　in the sushi shops, meaning "tears". A piece of fresh wasabi is added to the bento, with a tiny green grinder for extra fresh flavor! perpared with the stem and leaves of the plant and seke lees. A bit of sugar can be added. ©　More in the Japanese WIKIPEDIA ! This is a kind of hot sidedish with many types of fish. It is said to prevent stomach upset in the summer season. The easiest preparation is with sugar and vinegar, but there are regional recipies for the mix, mostly with sake lees. 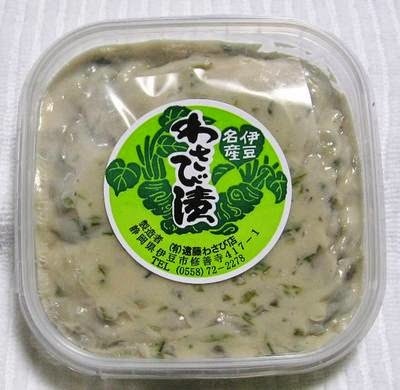 It is a favorite regional souvenir.
. wasabi - spring Kigo . 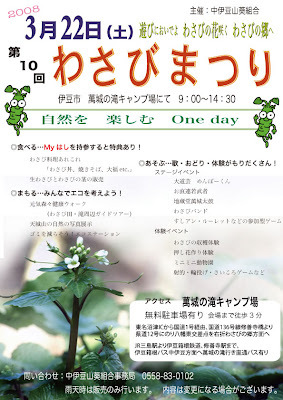 In Yamanashi, best from Kosuge village 小菅村, proud of its clean water.
. Washoku - Yamanashi Prefecture . grown in Hokkaido, indroduced by the Europeans. They are rather small, but a whole field in bloom is quite a sight.